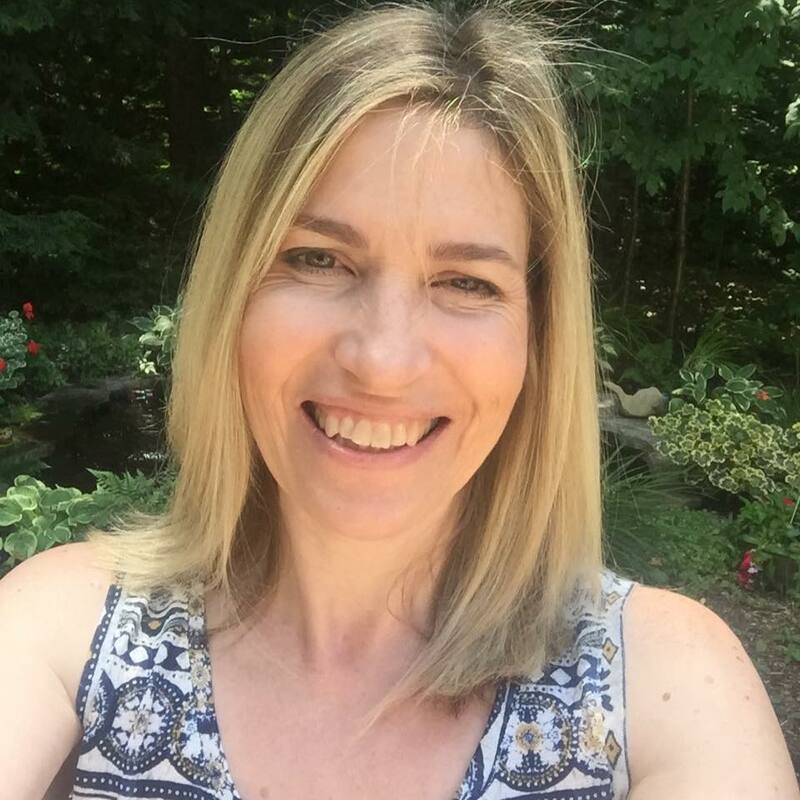 Today I an thrilled to welcome Sunny Studio as my guest! They are offering a die set to one lucky winner! Well I don't have a cute Moose/Reindeer like the one I just spied... but I do have a reindeer and some trees... so thank you for inspiring me. Lindsey's tags are absolutely adorable....I am inspired to create a couple just like hers. So gorgeous tags, love Francesca's tag with pretty poinsettia and your deer tag is so cute! I just love the stamps from Sunny Studios! These tags are adorable. I especially love the reindeer. I love all these sweet tags! Sunny Studio makes the most adorable images, don't they? 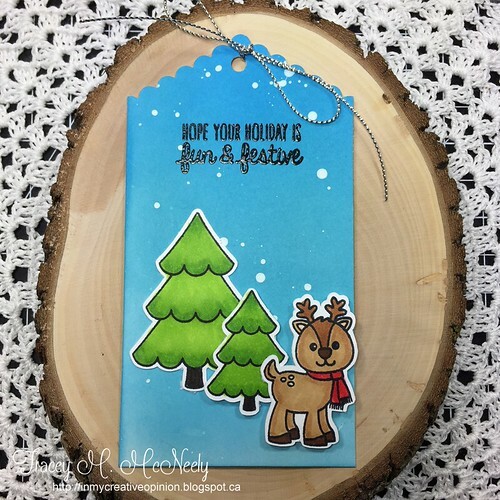 I love the scene you create on such a tiny tag with the cute reindeer, trees, and white snow dots Tracey! TFS sharing....all the tags are fabulous! The polka-dot tag base works so well on the Polar Playmates set. Smitten with all the sweet critters sporting their winter toques and scarves! Cuteness galore! Darling tags ladies. Especially love the sweet critters on Mendi's tags. Cute, cute, cute! More great tags and stamps--I really like seeing all the creative details that y'all are including on the tags! Loving all the cute little critters on today's tags. Such adorable tags!!! Thanks for all of the inspiration!! Such cute images shown today! Your tag is so cute & love the bright colors--my favorite of the day, Tracey! WOW, what amazing tags, everyone is so creative and your Tracey has given me an idea of my own. Beautifully done by everyone! Sunny Studio is one of my favorite companies, and these tags are a good example of why. Just look at the great font of the bold greetings (like "Joy to the World" and "Merry & Bright"). Plus the images of the critters are completely heart-warming!! All of the tags shown here are completely wonderful and I am so glad I don't have to pick a favorite!! How cute! I love how everyone made their tags uniquely their own. Fabulous creativity and inspiration. Beautiful tags. Love the poinsettia tags. Wow...adorable tags....I have been wanted to get busy with Christmas chores...and this is just the ticket....or “TAG”. LOL....great samples....holiday hugs..
Loving the critters on these tags. So adorable. 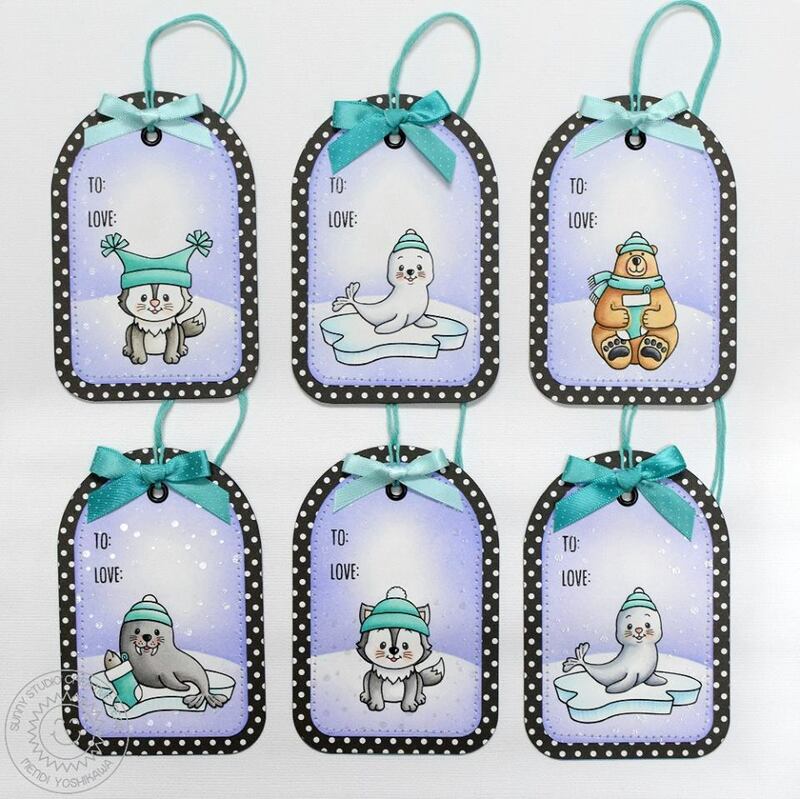 Lovely tags, all of them, love the first set by Mendi, these little critters are so cute! Saw it at Mendi's blog, so so cute, love the adorable deer! Love the cute reindeer on your tag. These tags are beautiful. I have some of these stamps so I will definitely being making some. Tracey, your tag is adorable. Great tags. I like Francesca's poinsettia tags. Great critter tags, but the poinsettia's really caught my eye! I love Sunny Studios! And isn't Mendi just the greatest? All of the tags are so adorable. Those cute critters on the tags with the black panel behind are the inspiration I have used today. All the tags from the designers rock! These tags are adorable! Thanks for the inspiration! Such cute tags...love the sweet expressions. These are all great tags but my favorite are Mendi's cute little animal tags! I saw Mendi's tags on her blog. Love these colorful tags by the design team - super cute and colorful! Your little reindeer is so cute! Thanks for another great day of inspiration!! Lovely! Thanks for such beautiful inspiration. The tags by Francesca Vignoli are what inspire me today. The softer colors are beautiful. Thanks! Your tag Tracey is so sweet ! The animal tags are soo cute and adorable!!! The cat one is too cute! Ahhh...love Sunny Studio! These are all so much fun! 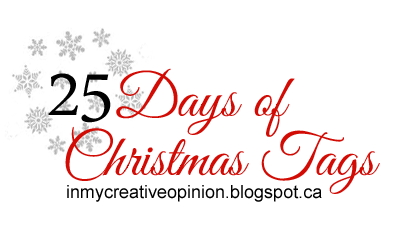 Tracey, your tag is super festive and fun just like the sentiment says! 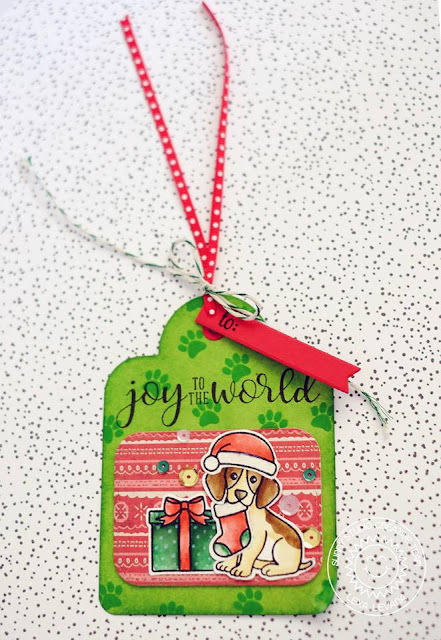 Today, the tag that inspired me the most is the "Joy to the World" tag with the puppy on it. We just adopted a 10 month old puppy so using dog images would be perfect on tags this year! Inspired by the watercolor background on the cat tag ... I need to try that!! These tags are adorable. I love the reindeer and tree. I have some already colored II will have to make a tag using these. These are just wonderful - thank you!! Awww!!! Adorable tags!!! I'm inspired by this great use of colors and by sweet critters!!! I love all these!!! These are just so cute with all the fun colors used and the critters. I LOVE how you used that die at the top of yours to create your own tag. I might have to try this. I LOVE how it looks! That poinsettia stamp is just lovely! 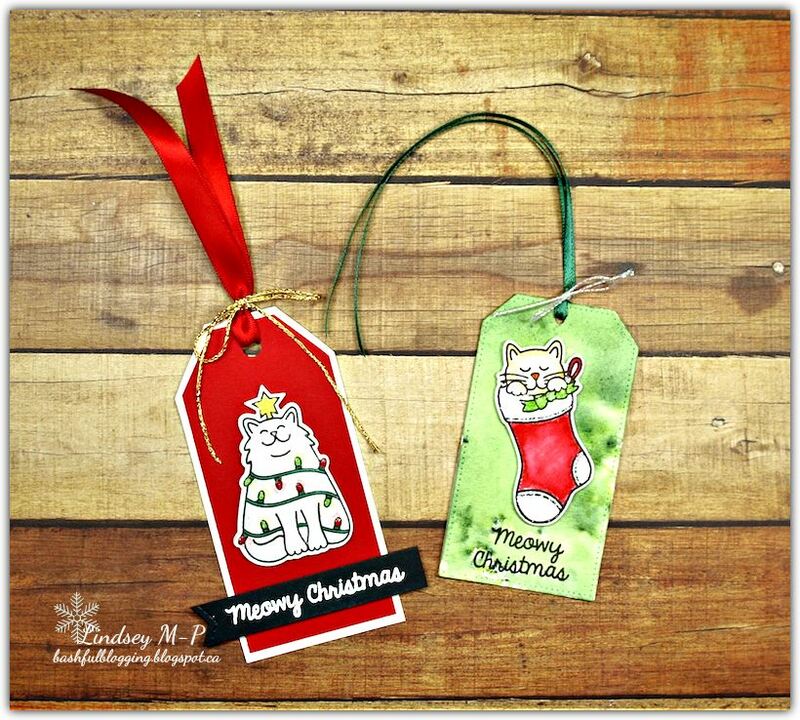 Super cute critters, love these from Sunny Studios and the poinsettias are perfect size for tags! Sunny Studios has some of the cutest critters. Love all these adorable tags! I have the poinsettia stamp and I love it. Great tags by Sunny Studio today! They really know how to do cute! Sunny Studio is a new company to me, I love seeing their products in the wonderful tags today! 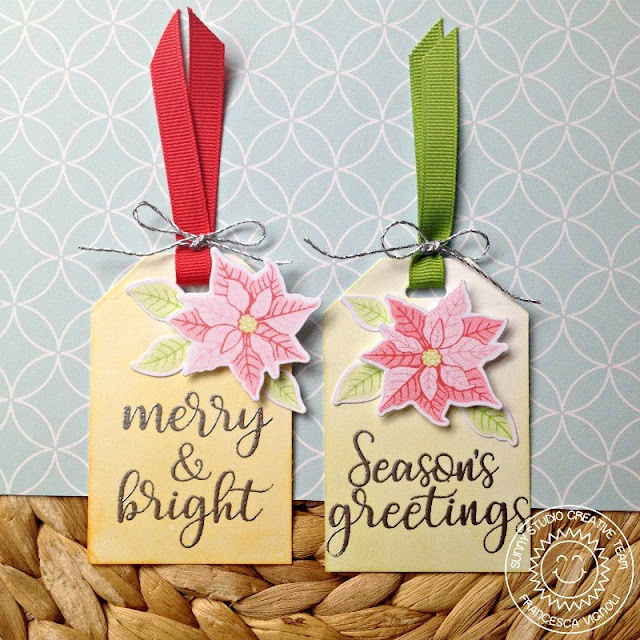 I love Sunny Studio layering stamps! I love those poinsettias. I'm inspired by Franseca's tags. Awesome tags! Sunny Studio has such delightful stamps! Mendi's tags are so sweet and adorable. 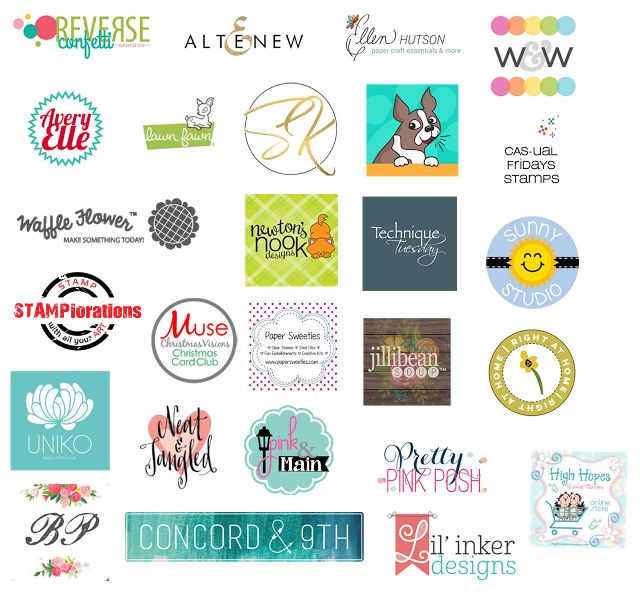 I always love the critter tags and appreciate new ideas on how to use them in my projects! I love Mendi's tags. Those critters are adorable. All these tags today are so cute. Mendi's tag with the sweet little winter scene and cute little critters colored so simply are my inspiration from today...I am in absolute love with the polka dot background. AWESOME TAGS! I especially love the polkadot frames for Mindi's sweet tags! 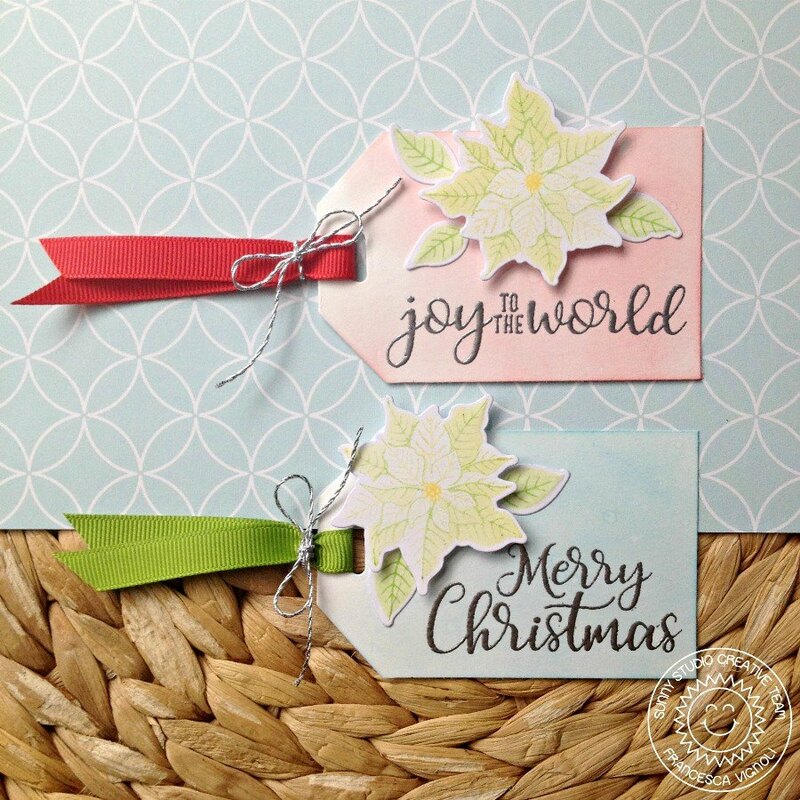 Love Sunny Studio products and these tags are absolutely adorable! Such fun tags - love all the poinsettias and the cute little critters. Can I say cute critters?!!! LOVE Mendi's tag assortment and Lindsey's adorable cat designs. Oh my! Look at all of that cuteness!!! I love all of those adorable critters!!! And the poinsettia tags are gorgeous!!! Adorable images from a company I'm meeting for the first time today. Mendi Yoshiktawa's tags are the cutest, just love them. I fell in love with the adorable set of purple, black and polar tags! I chose to create a penguin tag because the polar theme is so cute! So much sweetness here. Today is full of some great inspiration! Thank you. eeep! <3 those polar playmates on Mendi's tags. SO sweet! Gorgeous! Love Francesca's lovely poinsettia tags especially. The sentiments are really beautiful and I adore the pretty colors. Oh, they’re all so cute! I’m favorites are the set by Mendi Y. I love the combination of black, purple and teal colors with the adorable critters. Thanks for the inspiration. All so cute! I chose the black and white polka dot on Mendi's tag as my inspiration. supe cute tags, I love the Mendi's tags!